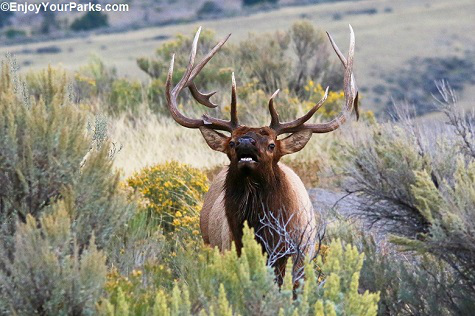 Bugling Bull Elk, Charles M. Russell National Wildlife Refuge. 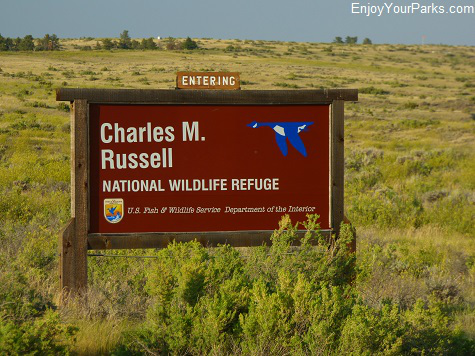 Established in 1936, the Charles M. Russell National Wildlife Refuge is the largest wildlife refuge in Montana, and the second largest in the United States. It's 915,814 acres surrounds Fort Peck Lake, as well as huge tracts of land to the west of the lake that surrounds the Missouri River. When adding the acreage of Fort Peck Lake, the Charles M. Russell National Refuge exceeds 1,100,000 acres, even though the actual lake is not officially part of the refuge. 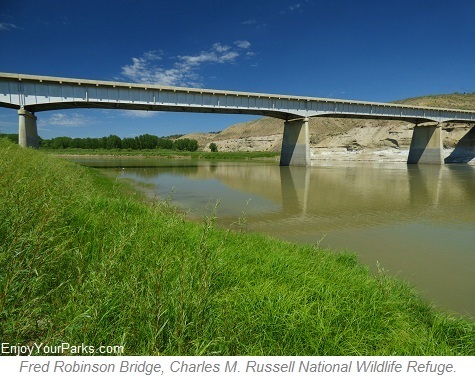 The Charles M. Russell National Wildlife Refuge stretches for 125 miles (air miles) along the Missouri River from the Fred Robinson Bridge eastward to the Fort Peck Dam. 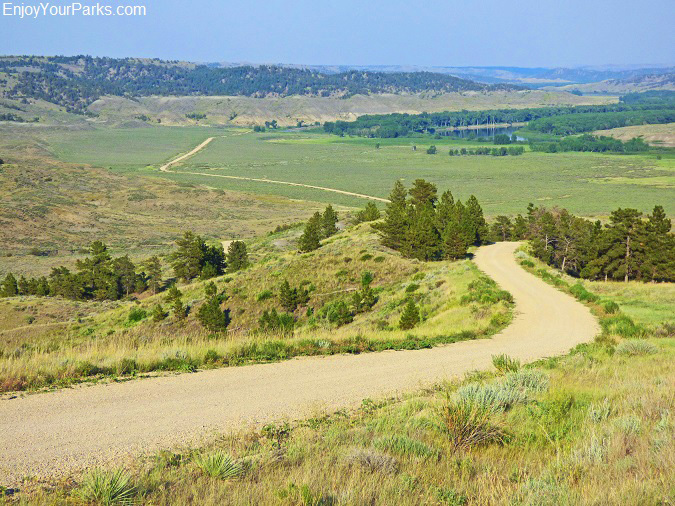 The furthest westward section of the Charles M. Russell Wildlife Refuge is also part of the Missouri Breaks National Back Country Byway. 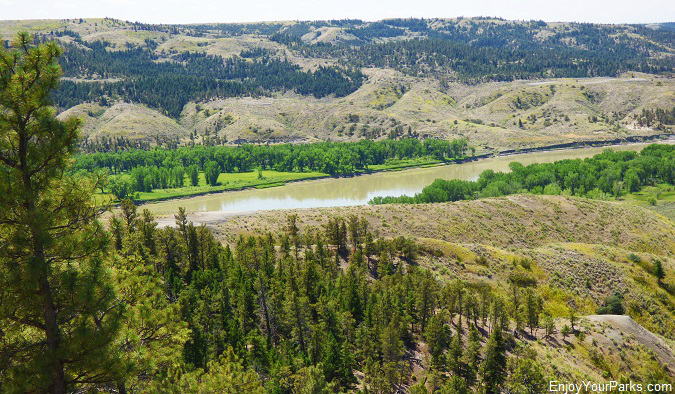 And also connected to the CMR Wildlife Refuge to the west is the 80 mile long Upper Missouri River Breaks National Monument, which is another monstrous area of virtually untouched wildland surrounding the Missouri River. So when you add all of this land together, the result is a vast expanse of wildlands along the Upper Missouri River in Montana that is unparalleled. 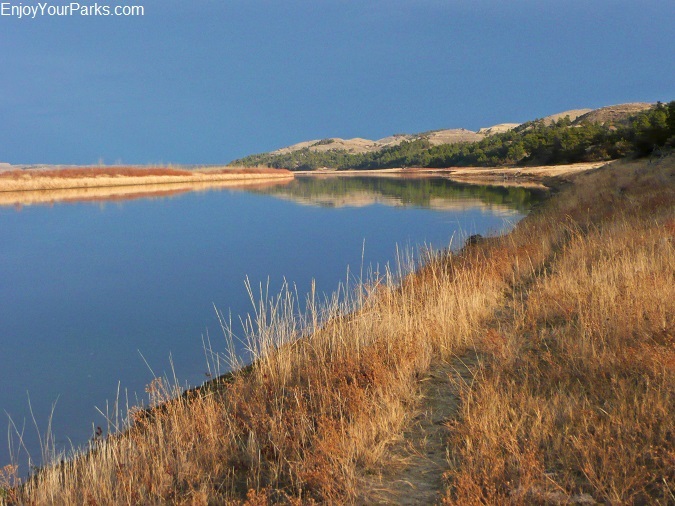 The Missouri River runs through the entire length of the Charles M. Russell National Wildlife Refuge. This vast refuge was named after the world famous Montana cowboy artist by the name of Charles M. Russell. Not only was he unquestionably one of the greatest western artists of all time, but also held solid conservation principles that were far ahead of his time. 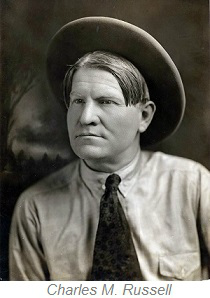 By naming this vast wildlife refuge after this legendary Montana artist is more than fitting. The landscape that makes up the Charles M. Russell National Wildlife Refuge is what we call "Missouri River Breaks Country". This breaks country includes vast badlands with evergreen forested coulees, sagebrush benches, cottonwood and willow river bottoms, and classic mixed grass prairies of the Northern Great Plains. Managed by the U.S. 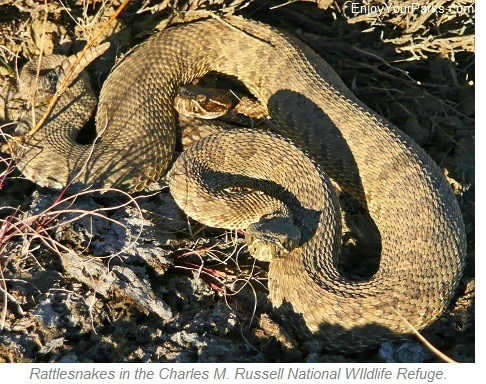 Fish and Wildlife Service, the Charles M. Russell Wildlife Refuge is home to abundant wildlife, including a tremendous elk herd, mule deer, whitetail deer, bighorn sheep, mountain lions, coyotes, pronghorns, beavers, prairie dogs, as well as many, many other species of wildlife and fish. 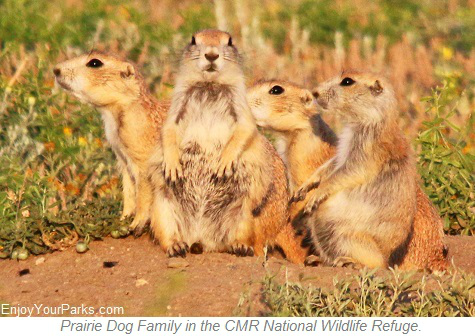 Among the list of endangered species found on the refuge include the black-footed ferret, burrowing owl, black-tailed prairie dog, gray wolf, greater sage grouse and pallid sturgeon. 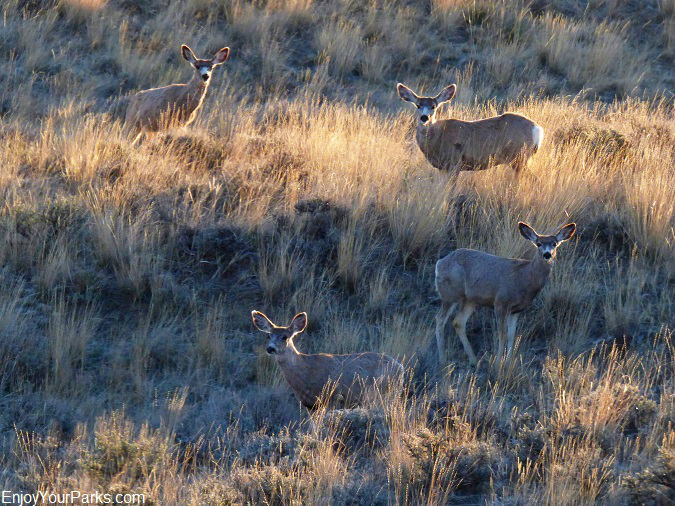 Mule deer really blend into their surroundings in the Charles M. Russell National Wildlife Refuge in Montana. 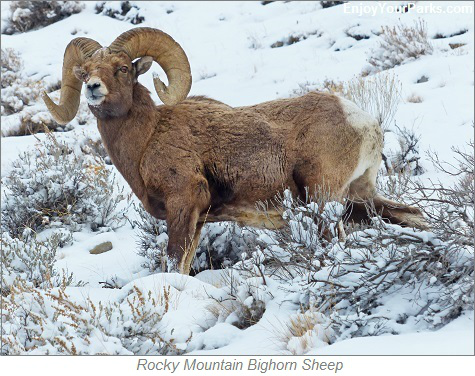 There are presently over 4,000 Rocky Mountain Elk that call the Charles M. Russell National Wildlife Refuge home, as well as the largest population of Rocky Mountain Bighorn Sheep beyond the Rocky Mountains is found in this amazing refuge. In addition, there are over 230 species of birds throughout the refuge as well. Within the Charles M. Russell National Wildlife Refuge in Montana rests the 56,000 acre UL Bend National Wildlife Refuge and the 20,000 acre UL Bend Wilderness. 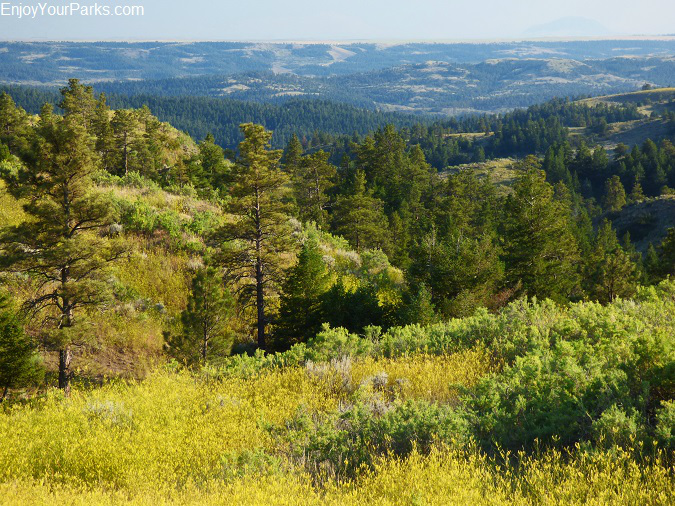 In addition, there are 15 other wilderness study areas throughout the Charles M. Russell National Wildlife Refuge of Montana, which are managed just as if they are actual wildernesses while the Congress considers them for formal wilderness designation. 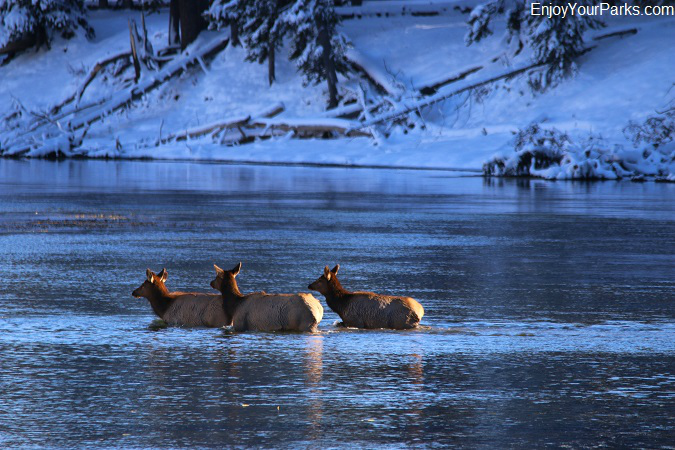 There are over 4,000 Rocky Mountain Elk that reside on the Charles M. Russell National Wildlife Refuge. 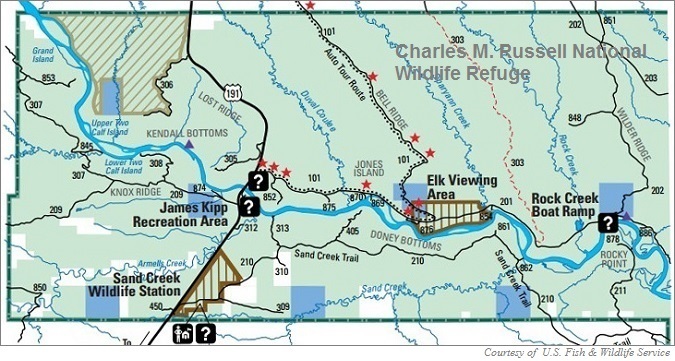 More than 250,000 visitors each year visit the Charles M. Russell Wildlife Refuge in Montana, which makes it one of the most visited national wildlife refuges in the U.S. 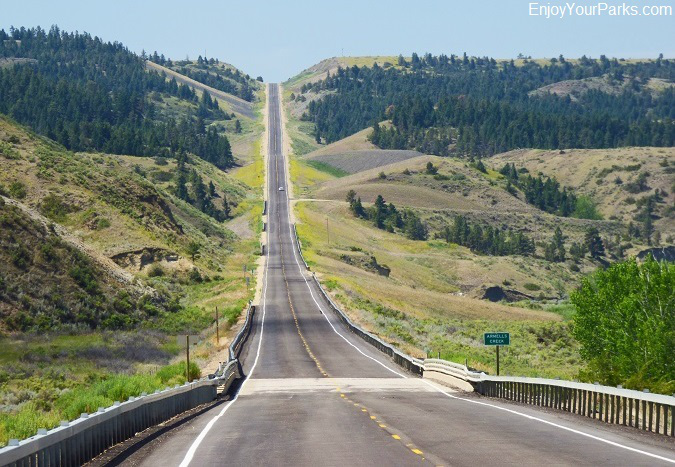 The two main highways that visitors take to enter the refuge is U.S. Highway 191, which allows access to the western section of the CMR National Wildlife Refuge, and Montana Highway 24, which allows access to the eastern boundary of the refuge. 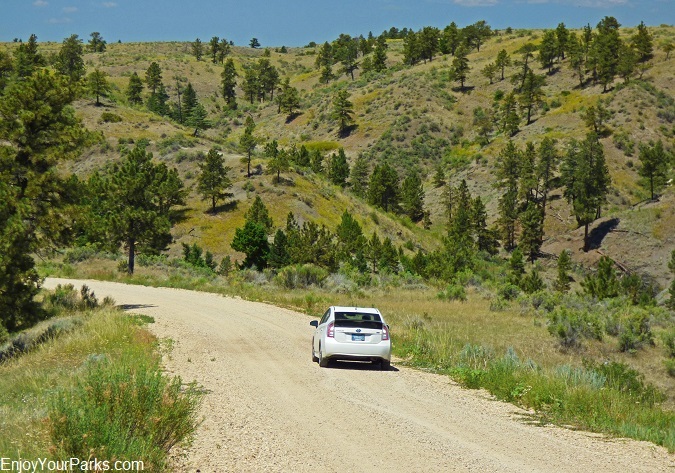 There are over 690 miles of mainly gravel and dirt roads, which provide access to nearly 80% of the refuge, including access to over 130 miles of the lake shore of Fort Peck Lake and river banks of the Missouri River. U.S. Highway 191 cuts directly through the cross-section of the western side of the Charles M. Russell National Wildlife Refuge. 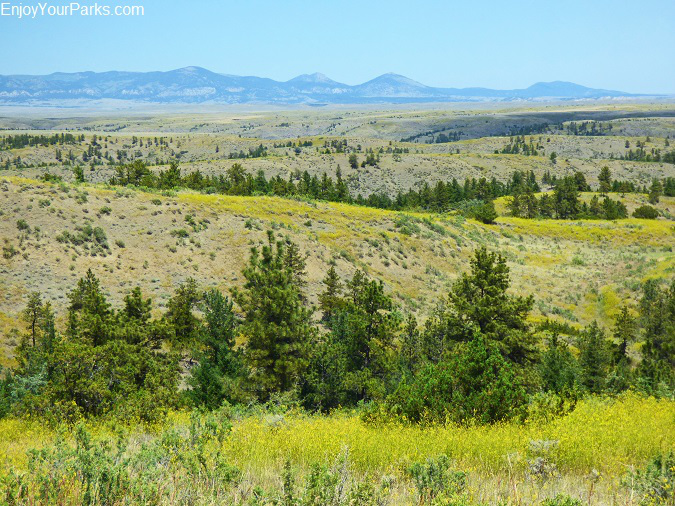 This area of the refuge is 65 miles north of Lewistown, Montana and 70 miles south of Malta, Montana. Fishermen running up the Missouri River inside the Charles M. Russell National Wildlife Refuge, Montana. steamboats which were heading for the world's most inland sea port at Fort Benton Montana. When the railroads found their way west in the 1880s, the commercial ships were no longer necessary. In 1903 there was extensive flooding in the lower section of the Missouri River, and with this flooding came the push for flood control development in Montana, South Dakota and North Dakota. In the 1920s the federal government considered building huge dams on the Missouri to reduce flooding, as well as significant electricity generation for the region. When the Great Depression hit the United States in the October of 1929, President Franklin Roosevelt felt that dam construction as a effective way of employing the tens of thousands of unemployed people in Montana. So beginning on December 12, 1933, President Roosevelt issued several executive orders which turned federal lands over to the U.S. Army Corps of Engineers for the building of Fort Peck Dam. 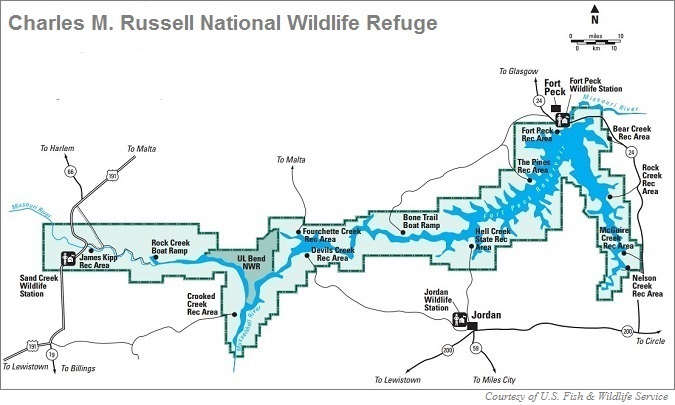 The Charles M. Russell National Wildlife Refuge is a vast area of "Missouri River Breaks" wildland. 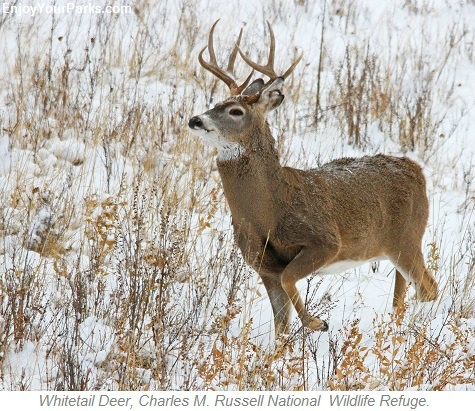 Mule Deer Buck, Charles M. Russell National Wildlife Refuge, Montana. refuges. Then President Roosevelt signed into law the "Migratory Bird Hunting Stamp Act of 1934," which required bird hunters to purchase a stamp to help generate money for the purchase of additional waterfowl refuge lands. President Roosevelt then issued another executive order that established the "Fort Peck Migratory Bird Refuge", which was to be the land surrounding the Fort Peck Lake that was rapidly filling. Shortly after this executive order, the area was then quickly designated more than just a bird refuge, but instead a general "wildlife refuge" by Roosevelt's executive order on December 11, 1936, the "Fort Peck Game Range" was established. 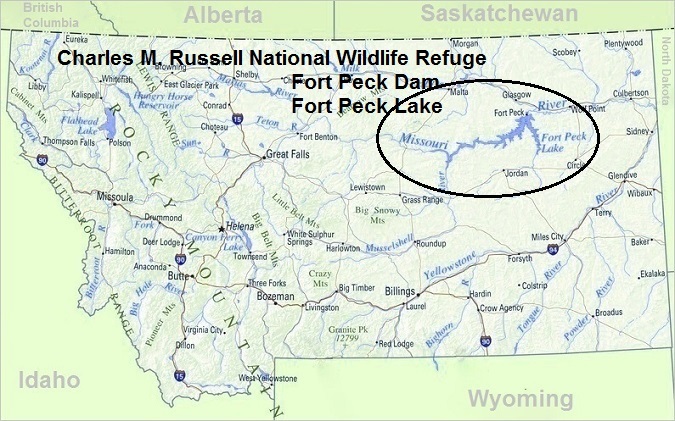 Then on February 25, 1963, President John F. Kennedy changed the name "Fort Peck Game Range" to the present day "Charles M. Russell National Wildlife Range". In time, the term "Range" was changed to "Refuge" to eliminate all oil and gas exploration on this land. Rocky Mountain Elk crossing the Missouri River in the Charles M. Russell National Wildlife Refuge. Because there was a tremendous amount of big game animals that congregated near the Missouri River in the CMR National Wildlife Refuge area, for thousands of years Native Americans such as the Gros Ventre, Assiniboine and Piegan Blackfeet hunted in this area. 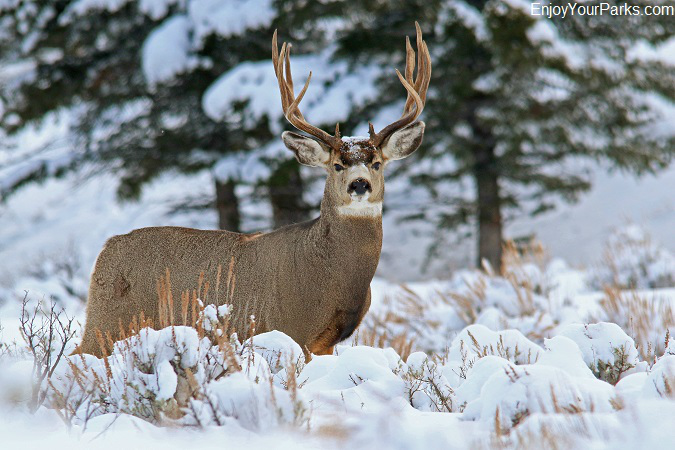 They hunted animals such as buffalo, elk, pronghorn, whitetail deer and mule deer. 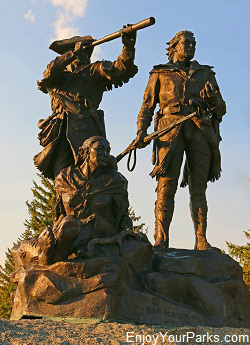 Between May 9th and May 18th, 1805, the Lewis and Clark Expedition spent time along the Missouri River that is now surrounded by the Charles M. Russell Wildlife Refuge, and several dangerous "close calls" occurred during their time on this section of the river. The first incident occurred on May 9, 1805 after they passed the Milk River, which they named it after the milky spring run off they saw pouring into the Missouri from this river. That night they camped about 2 miles from the present day Fort Peck Reservoir, near what they named Big Dry Creek (now submerged in the lake). Several members of the party began to have horribly swollen eyes along with large boils and abscesses on their skin due to all the alkali in the water and soil near along this area. The next day on May 10, 1805, William Bratton, an expedition member, was attacked by a grizzly bear. He shot it, but the bear continued to chase him. Bratton eventually outran the grizzly and expedition members later found the bear and killed it. Then on May 14, 1805, the expedition came across another grizzly bear that was sleeping in a sand bar on the river. The bear attacked 6 men, and even though the bear was then shot, it continued to charge, and chased the men down a 20 foot embankment that ended at the river's edge. The bear was finally killed, and Lewis named the creek near this spot "Brown Bear Defeated Creek". Today this creek is known as Snow Creek. overboard. Sacagawea, while holding her 3 month old baby Jean Baptiste, stood in the raging river and calmly collected nearly all of these precious supplies. That night, as the men slept underneath some giant cottonwood trees next to another creek, where a fire broke out. The men barely escaped with their lives just before a giant cottonwood tree came crashing down onto the camp. Lewis named this creek "Burnt Lodge Creek". Today this creek is known as Seven Blackfoot Creek. Further up the river they encountered the Musselshell River, and beyond that they passed a creek that they named Sacagawea Creek. This creek was later named Crooked Creek, but in 1979 the name was officially changed back to Sacagawea Creek. Lewis and Clark had a series of "near disasters" while on this stretch of the Missouri River during their 1805 epic expedition. 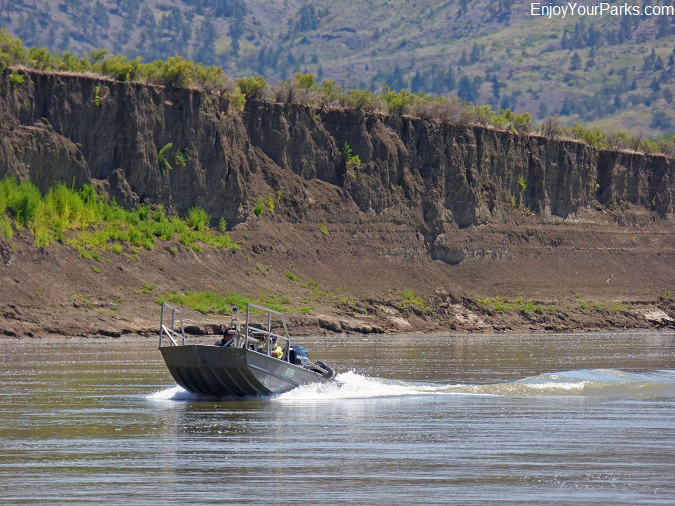 The Lewis and Clark Expedition left this region of the Missouri River on May 24, 1805, but not without having written many pages of diary entries recalling their many harrowing adventures along this section of the river. Needless to say, it was a memorable week spent along this wild stretch of the Missouri River, which today is known as the Charles M. Russell National Wildlife Refuge. 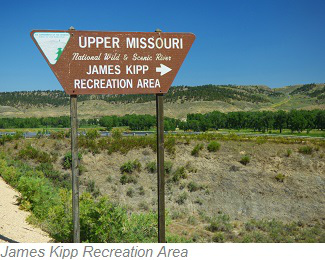 The James Kipp Recreation Area is located on the western side of the Charles M. Russell National Wildlife Refuge, and is actually within the boundary of the Upper Missouri National Wild and Scenic River. 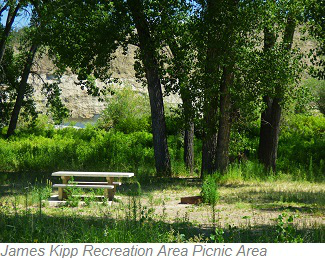 This extremely popular area is just off U.S. Highway 191, near the historic Fred Robinson Bridge. This area is the center of activity for the western side of the Charles M. Russell Wildlife Refuge. 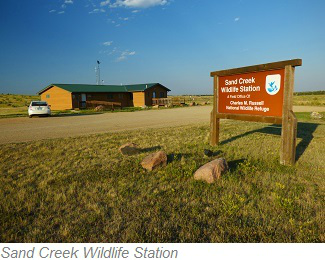 Just south of the James Kipp Recreation Area is the Sand Creek Wildlife Station, which is definitely an important stop before entering the refuge as it has extremely helpful material for you to study and enjoy. 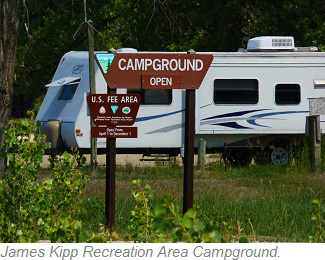 The James Kipp Recreation Area includes a very nice campground along the Missouri River, and well as a picnic area and boat launch. There is usually a camp host stationed here that will provide answers to any questions you might have, and there are also usually maps and other brochures and informative materials available here. The Slippery Ann Elk Viewing Area allows you to see hundreds of elk during their mating season in the fall, which is an incredibly wonderful treat! 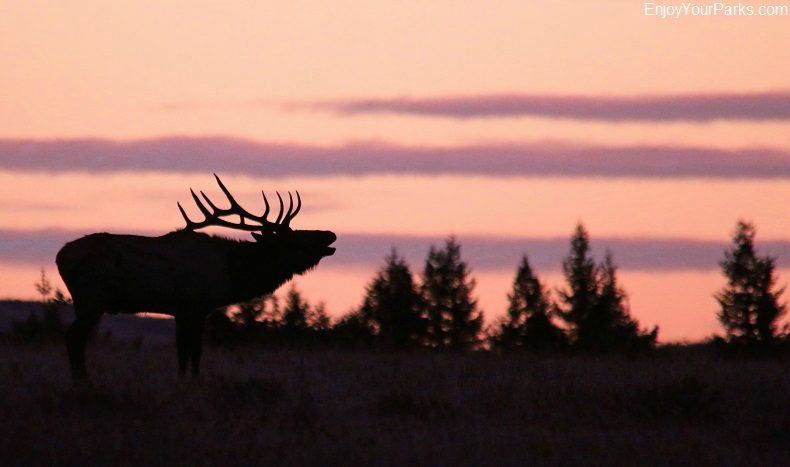 The Slippery Ann Elk Viewing Area is a fantastic place to see elk during the September and October breeding season, which is known as "The Rut". From this vantage point, you can watch up to 500 Rocky Mountain Elk congregate and put on a show for you as the bulls fight and bugle as they try to win over large groups of cow elk known as harems. 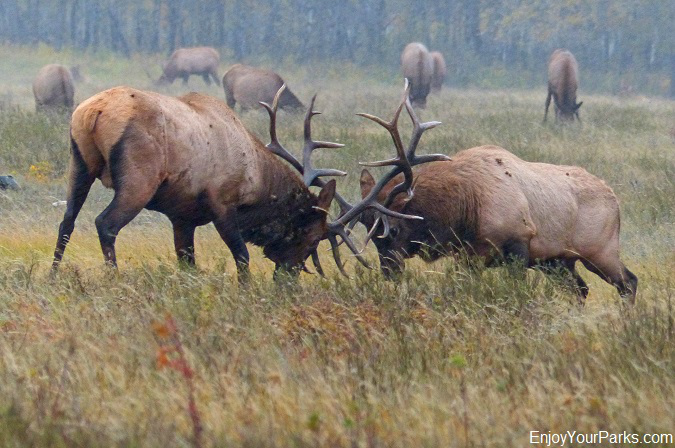 The best time to see this remarkable display of bugling and fighting elk is around the third week of September. 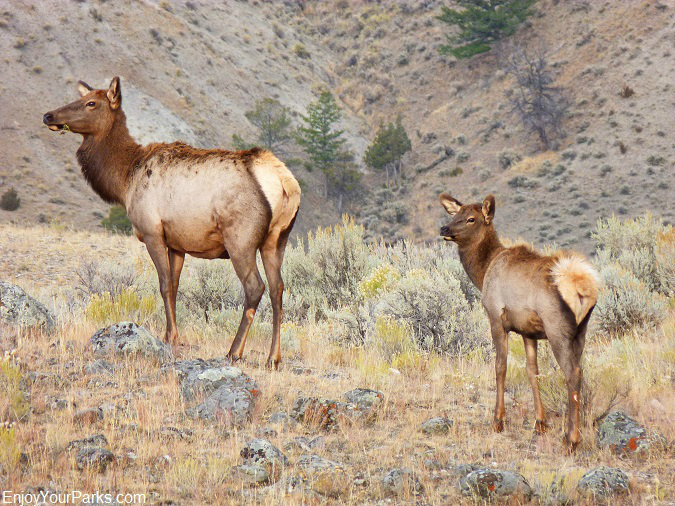 There are elk found throughout the entire refuge, but the Slippery Ann is a great place to watch these amazing animals from a great vantage point. On the Self-Guided Auto Tour in the Charles M. Russell National Wildlife Refuge. 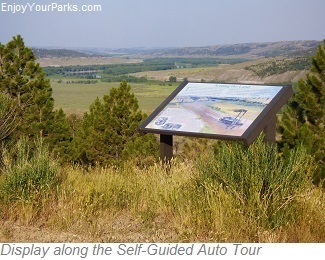 There is a fascinating self-guided automobile tour that begins just about a mile north of the James Kipp Recreation, that is very interesting as it works its way through the gorgeous Missouri River break country on its way to the Slippery Ann Elk Viewing Area. 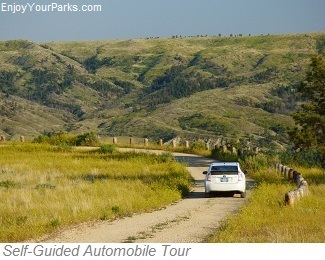 The Self-Guided Auto Tour is on a very nice gravel road that eventually takes you to the Slippery Ann Elk Viewing Area. Important Tip: Watch Out For Rain! welcome to explore. These roads are used by tourists, fisherman and hunters alike, and allow you to access the inner limits of this massive refuge. 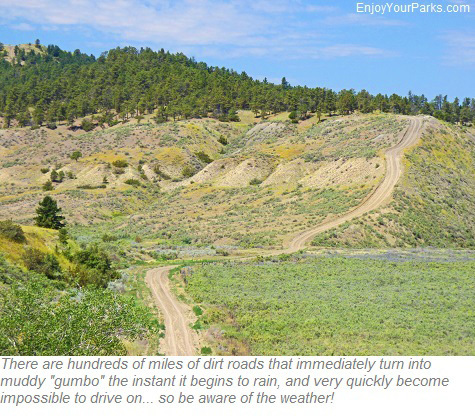 These dirt roads seem very non-threatening, but when it rains... even just a little bit, these dirt roads become virtually impossible to drive on as the dirt instantly turns into a thick, gummy consistency that we locals call "Gumbo". This "gumbo" will stick to your tires until you can not even turn the steering wheel of your vehicle, and even the slightest incline is too slippery to climb. So here's the suggestion: If there is rain in the forecast, or if you see rain clouds on the horizon... get back to either a gravel road or the highway as fast as you can. Seriously! Or you will be stuck in the back country until the roads once again dry up, which can take hours to even days depending on how much rain falls on the area. Paddlefish (left) and Pallid Sturgeon (right) are "living dinosaurs" found in the Missouri River throughout the Charles M.Russell National Wildlife Refuge. Paddlefish are among the largest freshwater fish in North America, weighing up to 200 pounds and a length reaching nearly 5 feet. These primitive fish have a very long paddle-shaped snout that is nearly a third of their entire body length. Scientists thought at one time this huge paddle-shaped snout was used to dig up food from the bottom of rivers or lakes, but recent research found that they are actually filter feeders. This means they open their very large mouths and strain zooplankton out of the water. So why these strange looking fish have paddle-like snouts is still a mystery. In the spring, paddlefish run up stream during high waters to spawn and lay their eggs on silt-free gravel bars, and this is where you will find fishermen throughout the CMR refuge trying to catch some of these fascinating fish. The pallid sturgeon (fish on the right in the above photo) are an endangered species, endemic to the Missouri River and Lower Mississippi River basins of North America. Named after its pale color, this rare fish is closely related to the shovelnose sturgeon but is significantly larger in size, ranging between 3 to 5 feet long and nearly 90 pounds. These fish can live up to 100 years, and scientists consider this strange fish to be a "living dinosaur", as it lived during the Cretaceous Period. This period was over 70 million years ago, and it has essentially not changed in appearance since then Along with the paddlefish, they are essentially living dinosaurs! Charles M. Russell National Wildlife Refuge. Fort Peck Lake is the fifth largest artificial lake in the United States. depth.) This monstrous lake is over 134 miles long, 200 feet deep, and has a lakeshore of 1,520 miles in length, which is longer than the California coastline. In addition to the Missouri River feeding this reservoir, lesser tributaries such as the Musselshell River, Timber Creek, Hell Creek, Dry Creek and Fourchette Creek feed the lake as well. This huge reservoir was built to reduce the severe flooding that was present along the Lower Missouri River during the early 1900s, and is surrounded by the Charles M. Russell National Wildlife Refuge. 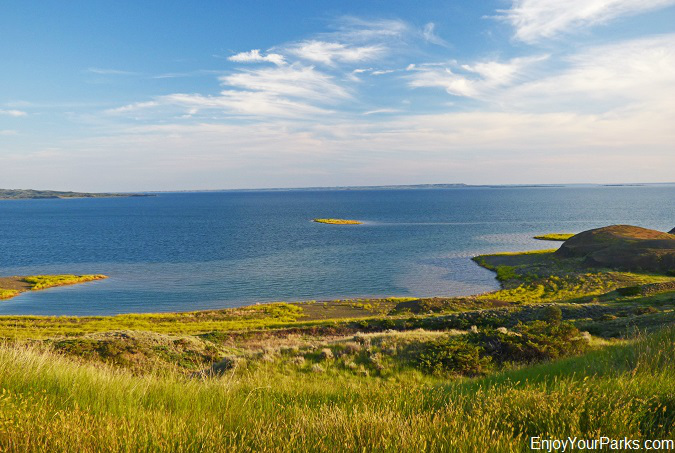 Fort Peck Lake has some of the best Walleye and Northern Pike fishing in the country. 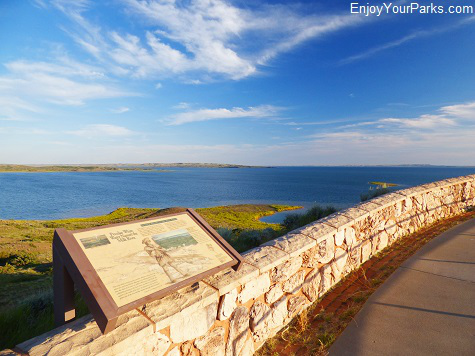 Fort Peck Lake is a significant tourist attraction, with 27 designated recreational sites along its lakeshore. Located 120 miles north of Billings, Montana, and 140 miles east of Great Falls, Montana. 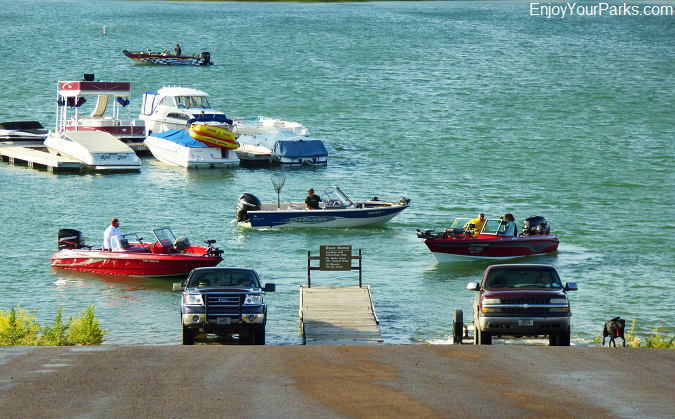 Aside from boating for pleasure and or water skiing, Fort Peck Lake also provides some of the best Walleye and Northern Pike fishing in the United States. 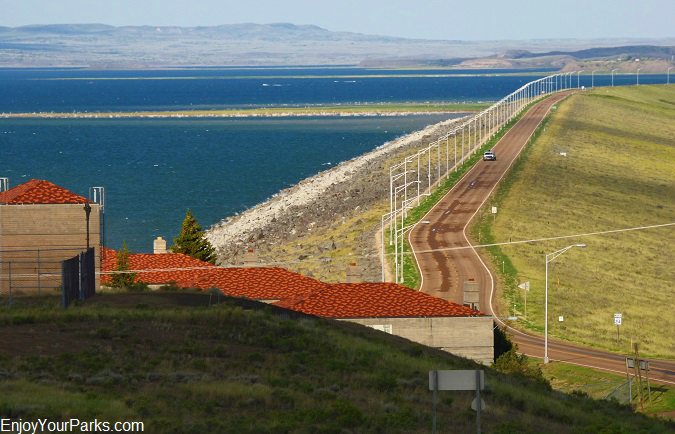 Fort Peck Dam is 3.5 miles long, and is the largest hydraulically filled dam in the United States. Built in 1933 to 1940 by the U.S. Army Corps of Engineers, Fort Peck Dam is the largest hydraulically filled dam in the United States, and is the highest of the six major dams found along the Missouri River. This magnificent dam is 250 tall and 21,026 feet long, and was built for purposes of flood control, hydroelectric power and water quality control. The water began to fill the lake in 1937, and ten years later, in 1947, the lake reached full capacity. This immense dam covers 3.5 miles as it spans from one bluff to another, creating Fort Peck Lake. Today, not only does this mighty dam continue to help control flooding and generate hydroelectric power at the tune of 185,250 kilowatts generated by 5 huge turbines, but this famous dam is responsible for the vast area of outdoor recreational opportunities for boaters, fisherman and hunters. In fact, just within a few miles of the dam there are six established recreation areas. And as previously mentioned, the Charles M. Russell Wildlife Refuge was created as a direct result of the construction of Fort Peck Dam. The Fort Peck Dam was part of what is known as "The New Deal", a policy created by President Franklin Roosevelt during the Great Depression years. Construction began in 1933, and the project employed 10,540+ workers. This incredibly complex and large project was finally completed in 1940. 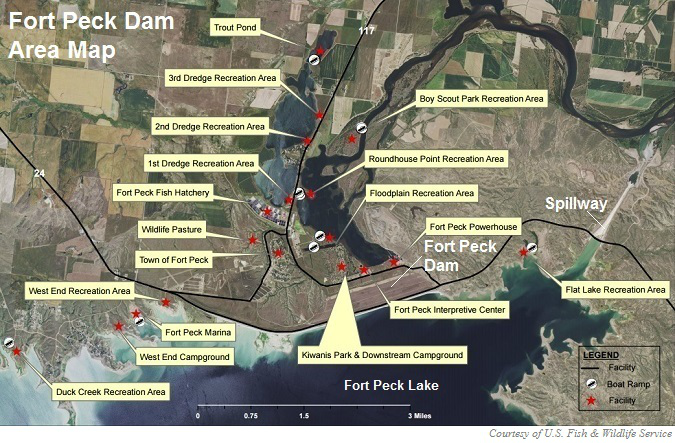 The name "Fort Peck" was adopted from an old trading post that existed near this site in the mid 1800s, which was established by Colonel Campbell K. Peck and Commander E.H. Durfee in 1867. Fort Peck was the center of fur trade with the Sioux and Assiniboine Indians during that time. 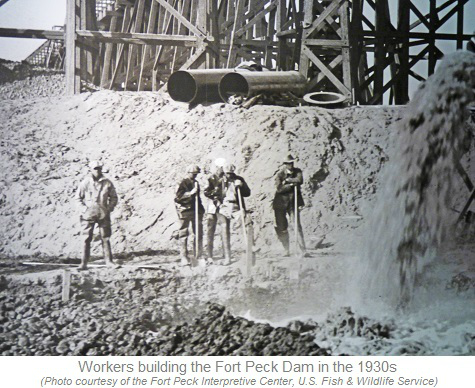 The Fort Peck Dam is truly a civil engineering marvel, in which the Fort Peck Interpretive Center does a tremendous job explaining how this remarkable project unfolded, including the horrific construction accident on September 22, 1938 where 8 men lost their lives. Two of the men's bodies are forever entombed within the dam. Fort Peck Interpretive Center of the Charles M. Russell National Wildlife Refuge. This outstanding visitor center is located near the Fort Peck Dam, and is very much worth spending time in. 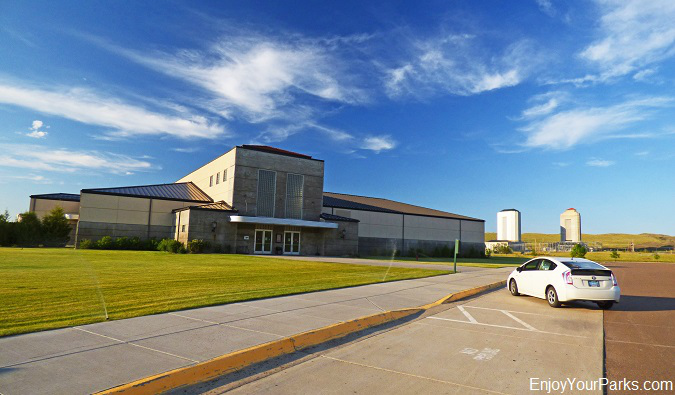 Near the Fort Peck Dam lies the Fort Peck Interpretive Center. 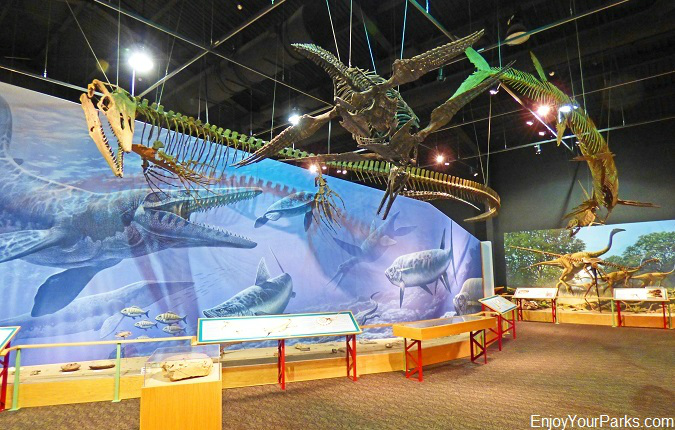 This gorgeous center is a "Must See" as you explore the Fort Peck Lake area and Charles M. Russell National Wildlife Refuge , as it not only does a fantastic job showing you the amazing history of Fort Peck Dam and Fort Peck Lake, but also is home to a fascinating museum of dinosaurs and present day wildlife. In fact, there is a life sized model of "Peck's Rex", which was a Tyrannosaurus Rex that was found just 20 miles from Fort Peck. In addition to a host of other dinosaurs, there is a fabulous wildlife display that illustrates the type of animals that live in the Charles M. Russell Wildlife Refuge. There are also two large aquariums that houses several live specimens of fish that live in these waters. 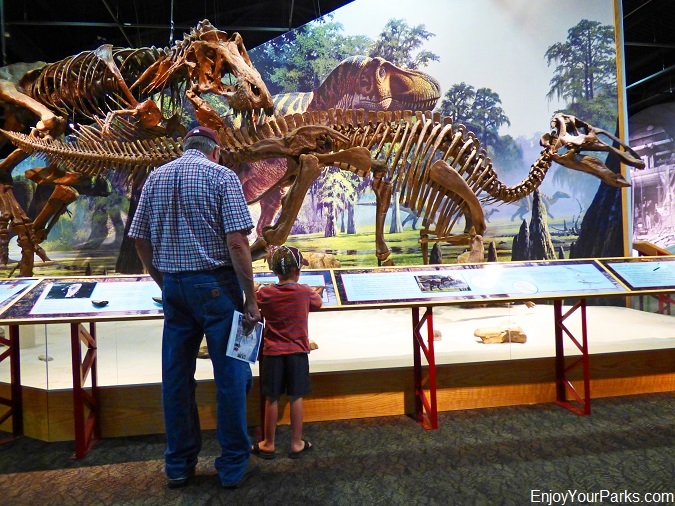 These dinosaurs are on display at the Fort Peck Interpretive Center, which is located at the eastern end of the Charles M. Russell National Wildlife Refuge, near the Fort Peck Dam. all the way to the Gulf of Mexico, and was 2,500+ feet deep and 600 miles long. A large assortment of dinosaurs lived in this sea and surrounding lands, and resulted in very high quality preservation and fossilization of animals and plants during this period. Then about 1.5 million years ago, the Musselshell River, Yellowstone River and Missouri River all flowed northward and created a large lake. And throughout the many ice ages between 2.5 million years ago to 10,000 years ago, massive ice sheets pushed these rivers toward the south and into their present courses. These gigantic glaciers cut through tremendous amounts of what is known as "alluvial deposits" from the area, exposing a significant area of erosion of land that surrounded the Missouri River. With this massive erosion, vast amounts of fossilized plants and animals... which included dinosaurs, became exposed. These fossils are found throughout the Charles M. Russell National Wildlife Refuge, such as the Thescelosaurus, Mosasaurus, Ankylosaurus, Pachycephalosaurus, Triceratops and the ever popular Tyrannosaurus Rex are all found throughout the lands of this amazing refuge. 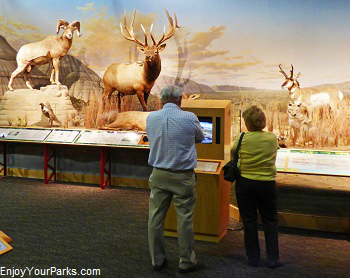 The Fort Peck Interpretive Center is extremely informative and fascinating, and we highly recommend that you spend plenty of time in this outstanding visitor center. 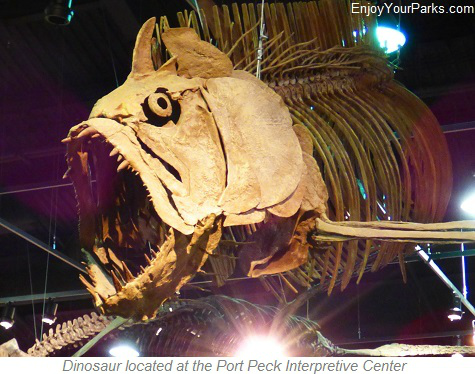 The Fort Peck Interpretive Center is where you can sign up for several interesting tours, which include the power plants and dam, and there are many fascinating programs given throughout the summer, which include amphitheater programs, theater presentations, and even nature hikes. 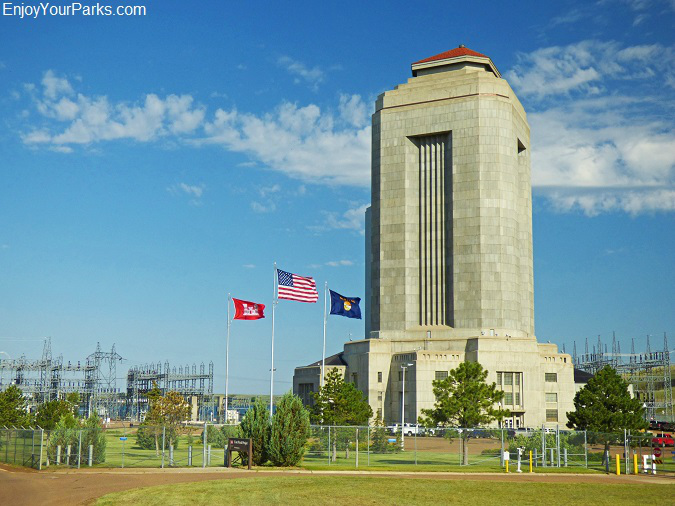 Fort Peck Power Plant #1 is home to the Fort Peck Power Plant Museum. 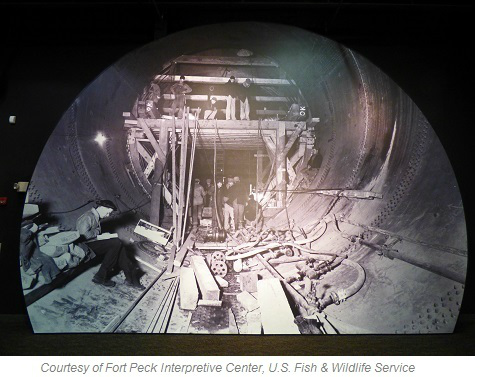 The Fort Peck Power Plant Museum is another fascinating museum located in Power Plant #1, which is found about a mile east of the Fort Peck Interpretive Center. The museum does a great job explaining the history of the dam and power plants, including the interesting history of how these gigantic structures came to be. There is also a very well done display of area fossils, which includes a Triceratops skull. Free guided tours are given daily of the power plant, and are very much worth the time.